Mobile World Congress never ceases to amaze, and this year was no exception. More than 85,000 people attended and over 1,800 companies participated, including Facebook’s Mark Zuckerberg, IBM’s Virginia Rometty and Cisco’s John Chambers, just to name a few of the notable keynote speakers on hand. The theme of Mobile World Congress 2014 was “Creating What’s Next,” and the conference truly encompassed the future of mobile — from super-cheap smartphones, to connected cars, to smart cities, to wearables, to the Internet of Things. These themes prevailed in a sea of eye-catching high-tech displays featuring almost every major technology company on the planet. 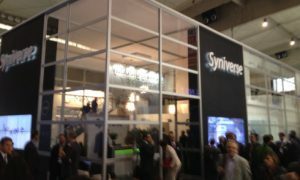 Among the highlights for Syniverse was the announcement of an emerging area of mobile that we forecast will present a new $44 billion annual market opportunity – “mobile context.” This is the insight into subscriber information, behavior and location that is available to operators and that can be offered to companies to improve the customer experience and increase brand loyalty and revenue. Following rapid advances in technologies and usage patterns that have transformed mobile users’ expectations for interacting with brands, it will be critical to integrate mobile context to meet mobile consumers’ increasing expectations. Customers want engagement in real time and in context to their usage, operators have new opportunities to climb the value chain, and brands have to better understand characteristics like where they like to go, what they like to do, and what they like to buy so they can better serve these needs. Building on this, we also unveiled a new strategic relationship with MasterCard to deliver enhanced payment security and convenience for consumers traveling abroad. The services are designed to go a long way toward reducing consumers’ frustrations associated with having their payment cards used without their knowledge or having their own transactions unnecessarily declined when trying to make purchases in another country. In tandem with this services announcement, MasterCard’s President of Global Strategic Alliances, Hany Fam, and I took part in a Mobile World Congress session called “Mobile Retail: The One Stop Shop” along with leaders from Deutsche Telekom, Citi and Walmart. We explored how mobile is creating a whole new retail experience and how strategic partnerships among financial institutions, retailers and mobile solution providers form a cornerstone of this experience. 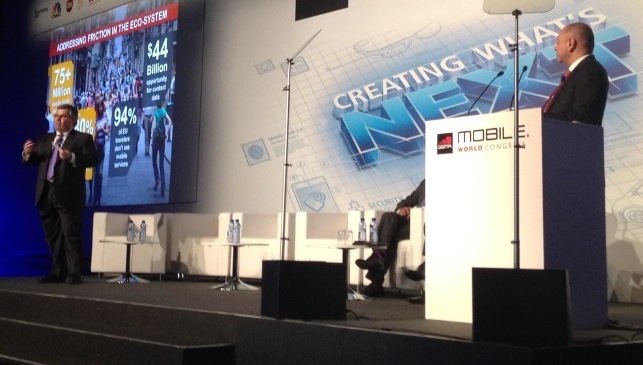 Me (left) and Hany Fam at our Mobile World Congress session. All told, we’re excited about what lies ahead for mobile context and look forward to working on new mobile context solutions to help both companies and operators deliver new services to their customers. Among other highlights at the conference, one of the most prominent consumer trends that emerged was the growth in wearable mobile devices. Increasingly, they are being designed as fitness trackers to gather ever more data about how we go about our daily lives, and Sony, Samsung and Huawei were just a few major players that unveiled new products in this area. The larger size of smartphones was another big consumer trend on display. As an example of how smartphones are changing, IDC estimates that in China, the largest smartphone market in the world, at least 20 percent of all smartphones shipped last year had screens of five inches or larger, and It predicts that number will shoot to 50 percent by 2017. In sum, this year’s conference showed how we are “Creating What’s Next” in a number of ways and the phenomenal trajectory of the mobile industry. Were you able to attend Mobile World Congress? If so, what did you think? If not, what impression of it did you get from the news? I would love to get your comments.